Harvesting my first deer was a two year long journey. As fledgling hunters, Nick and I spent our first season simply trying to lay eyes on a deer. This year, I finally had an opportunity to harvest a buck on the very last weekend of the season. The story of that hunt — A Girl’s First Deer — is posted on the Backcountry Hunters and Anglers’ Backcountry Blog. It was an incredibly emotional and almost surreal experience to walk up and touch the deer I had just killed. One aspect of the unreal feeling likely had to do with the novelty of the experience. While it’s common for people to have up close and personal experiences with squirrels, rabbits, and birds in their non-hunting day to day life, I had never been closer than a hundred yards from a deer. Even then, the moment was fleeting. But there was another, much deeper aspect of my inner experience as I lay my hands on the deer. His body was the culmination of years of thinking, preparing, and striving. All of the hours behind binoculars meticulously scanning the rocky landscape, all of the steps with a heavy backpack, and all of the frustration of repeated failure brought intensity to that moment. The sadness I felt at the deer’s pain and death, the appreciation I felt for his flesh, and the excitement of success brought complexity to that moment. My head was spinning. My first deer was a young desert-dwelling buck. Field processing wild game was an intimidating endeavor to me at first, but we had full intentions of doing all of the butchering ourselves. First we broke down, skinned, and deboned the deer among the desert boulders and prickly cholla. After allowing the deboned meat to cool for a bit in the shade, we divided flesh from the legs and neck into two separate game bags. Our third game bag held the loins and organ meat. These bags were then loaded into our hunting backpacks (built for carrying heavy loads) for a 3.5 mile climb out to the dirt road where we’d left our car a couple days prior. Once home, the meat was moved into the freezer to allow the flesh to harden just a little. Nearly frozen meat is much easier to trim and work with than room temperature meat. One by one, I would remove muscle groups from the freezer and clean them. I would then pass the meat over to Nick who would work to trim away sinew or silver skin. 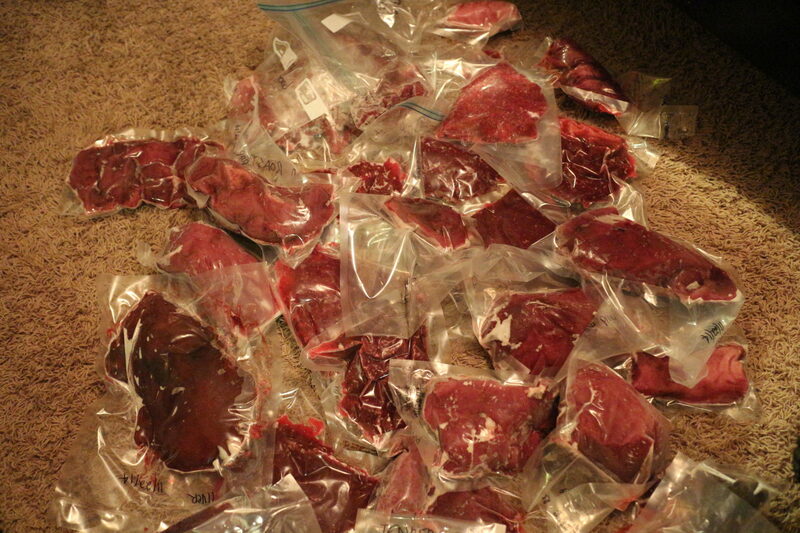 A significant portion of our venison harvest, vacuum sealed and ready for long term freezer storage. As we worked we made decisions about each muscle’s final destiny. Would this one work as a roast? Should that one be turned into ground? Do we want to cut it into steaks or leave it whole? We vacuum sealed our venison in meal sized portions. Meat that we planned to grind was frozen in chunks and run through the meat grinder a few days later. It’s been about two months now since I harvested my deer. Since then, I’ve cooked the venison multiple ways. Heart tacos, samosas, and venison burgers have made appearances on the menu. 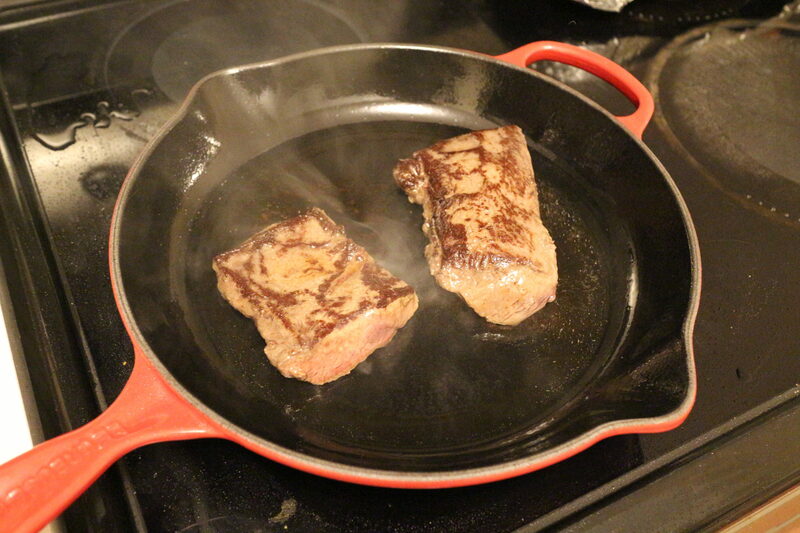 But the preparation that Nick and I like the best has also been the most simple: steak. We’ve prepared steak with pieces of backstrap and with pieces of hindquarter. While the leg meat is less tender than loin, a small hind roast from our young buck makes a fine steak by our standards. To be honest, I approached cooking my first venison loin with a bit of trepidation. I’d never cooked a steak before. To minimize the risk of screwing up, I put in some time researching general meat cooking principles. I ended up relying on this step-by-step steak guide quite a lot for my first time. 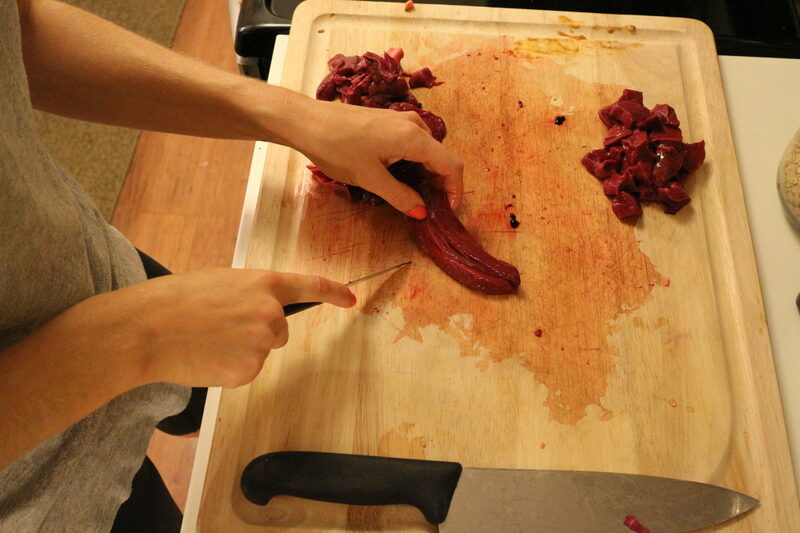 Cubing venison heart for heart tacos. But could venison steak be prepared just like the beef steaks I was reading about? To get a better sense of venison-specific techniques, I relied especially on people like Hank Shaw, Randy King, and other experienced wild game cooks. I learned from Shaw that there are some ‘universal truths’ about the differences between domestic and wild meat. Wild game will typically be denser (less tender), leaner, and more flavorful, to name a few. Leaner, denser meat can turn very tough and dry when overcooked, so care is necessary. 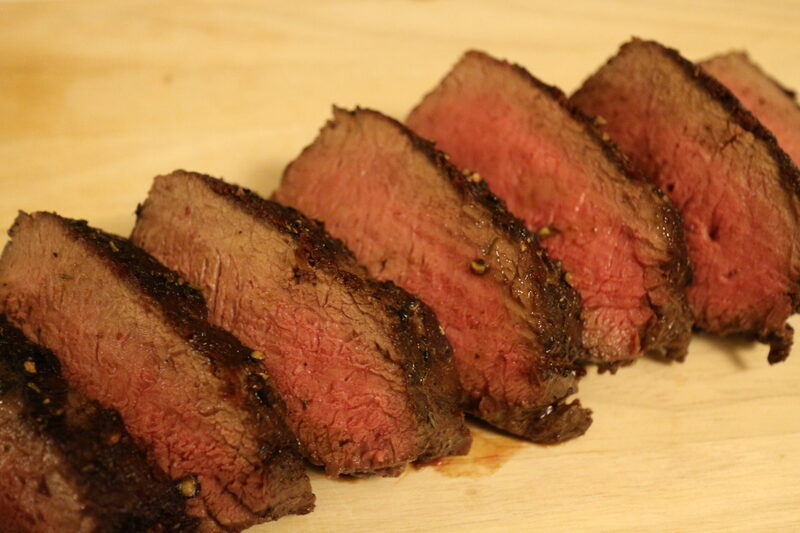 Venison steaks should be cooked ‘fast and hot’ and served medium rare for best results. We invited two good friends over the day after Christmas to share in our first taste of venison steak. It was a bit of a bold move, as this would be my first time ever making a steak of any type, but I knew they’d be understanding if things went horribly wrong. Happily, things went fantastically right. After defrosting the backstrap in the fridge, I removed the chunk of loin from its vacuum package, patted it dry, gave it a good dusting of salt. I let the meat sit for twenty minutes to come closer to room temperature before tossing it into a smoking hot cast iron pan. After cooking I dutifully made sure to let the meat rest for ten minutes before slicing into it. We wanted pure venison flavor to be front-and-center in this meal, so we didn’t use a marinade or sauce. Before serving I simply drizzled a bit of sizzling thyme-infused olive oil over the meat and cracked some fresh black pepper on top. When it finally came time to eat, I was blown away. The final product of our deer hunting effort was absolutely delicious. This may sound like an exaggeration, but Nick (who is not typically prone to hyperbole) declared “this is the best steak I’ve ever had”. Savory, nuanced, complex, and bold were all words thrown around the dinner table. We concluded that venison is certainly more flavorful than beef — in a good way. As Nick put it, venison has all of the flavors you wish that beef had. 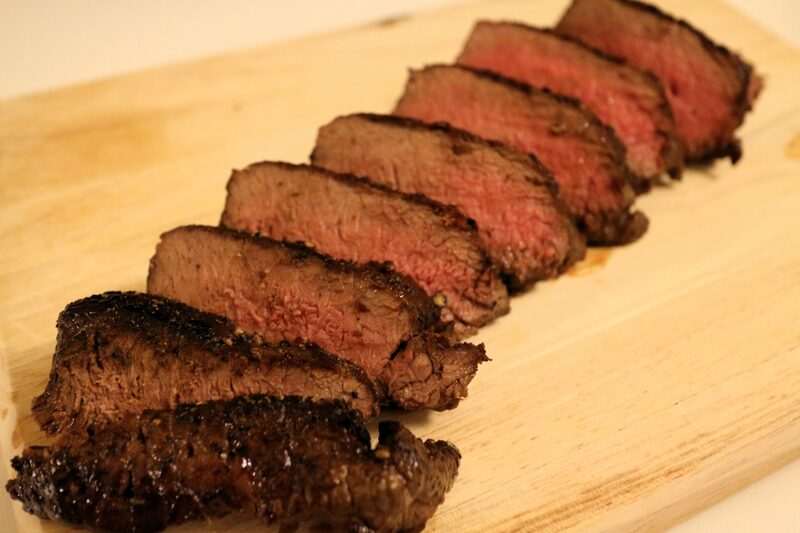 Our favorite way to eat venison. So simple, so flavorful. The venison backstrap that we ate wasn’t melt-in-your-mouth tender, but neither was it extremely tough. In terms of texture, I also enjoyed the contrast between the seared, almost crunchy ‘outer shell’ and the softer interior. Our friends, who had never eaten venison before, also loved the steak. You may have read about (or experienced first hand) venison that some people call “gamey”. Gamey flavor is considered a bad thing — that something about the meat tastes unpleasantly wild or weird. From what I’ve gathered, a bad gamey flavor is typically the product of meat that was not optimally handled by hunters post-kill. 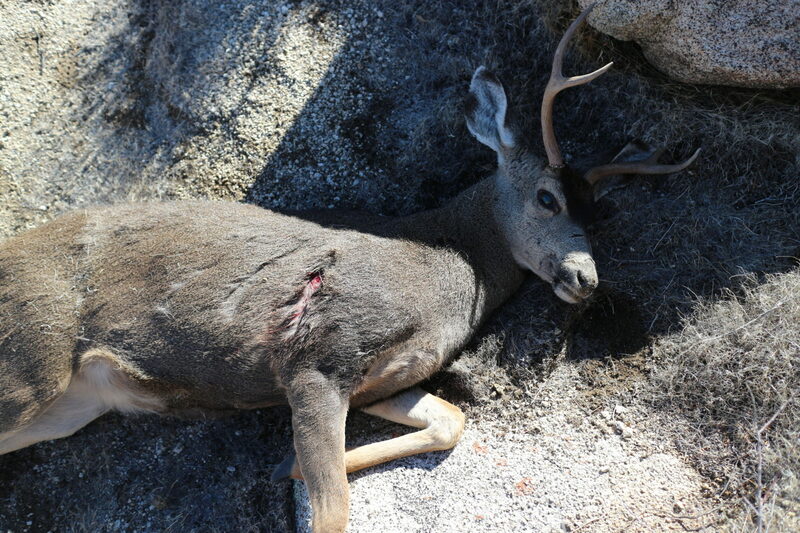 If you’ve had deer meat before and found it unpleasant, I would encourage you to give it another try. If you do the hunting and butchering yourself, you have the power to ensure your meat will be the best possible quality, which undoubtedly translates into the best possible taste. 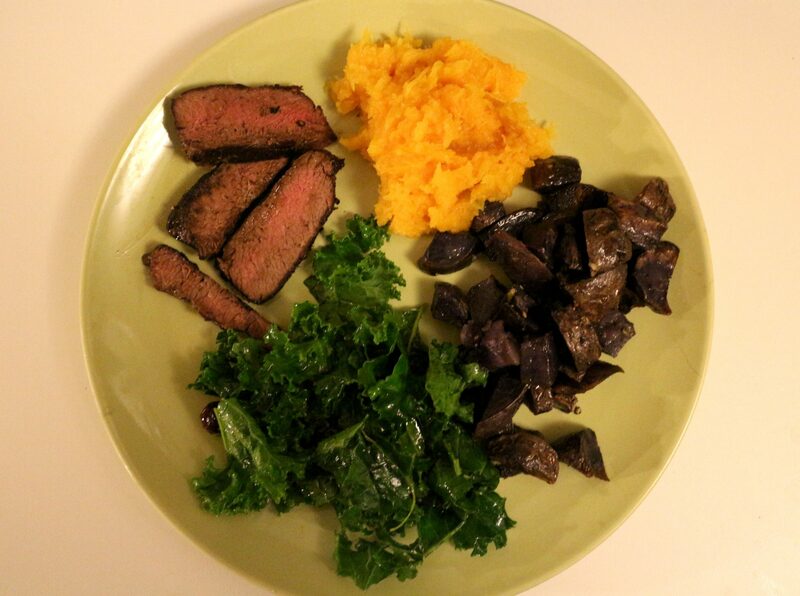 Venison backstrap, butternut squash, roasted purple potatoes, and kale salad. While I’m no pro chef, this meal was well-loved. So, what did I take away from this first time eating venison? I learned that deer meat, cared for and cooked properly, tastes fabulous on its own — no fancy sauces or marinades necessary. I also learned that even a former vegan with precious little meat cooking experience can make a great steak on the first try with the help of the internet. I also experienced the incredible feeling of sharing a delicious meal with some of my favorite people, knowing that no other person aside from me and Nick had ever touched the meat we were eating. I’ve never had a steak be quite so emotional, personal, and empowering.